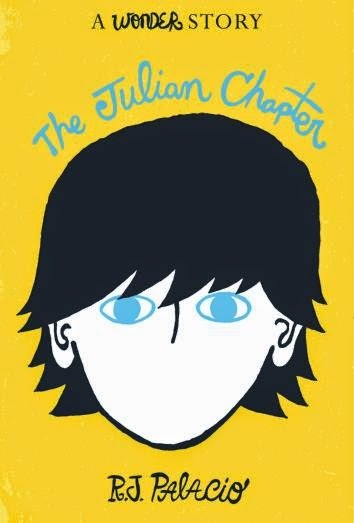 Did you know that Wonder author, RJ Palacio, has written a new story called The Julian Chapter? Yes! Debuting just this week, you can now peek into Julian's side of the story. Over 1 million people have read Wonder and have fallen in love with Auggie Pullman, an ordinary boy with an extraordinary face. Now readers will have a chance to hear from the book's most controversial character—Julian. From the very first day Auggie and Julian met in the pages of the #1 New York Times bestseller Wonder, it was clear they were never going to be friends, with Julian treating Auggie like he had the plague. And while Wonder told Auggie's story through six different viewpoints, Julian's perspective was never shared. Readers could only guess what he was thinking.Until now. The Julian Chapter will finally reveal the bully's side of the story. Why is Julian so unkind to Auggie? And does he have a chance for redemption? There's also a great interview with RJ on Slate. Check it out and have a Wonder-ful Wednesday!